The Bio Circuit vest is a interesting concept design created by two students at the Emily Carr University of Art + Design, Dana Ramler and Holly Schmidt. 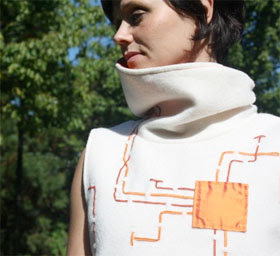 Bio Circuit provides a sound (e)scape in sync with the biological state of the wearer. As parameter of the biological state serves the heart rate which is slower and even when relaxed and calm and goes up with the stress feeling, excitement and anxiety. These different emotional cycles we pass through every day can be enhanced or influenced by sound, be it music of different types or sounds from our environment like birds, the flow of water which is associated with calm or the city sound scape of traffic, people walking and talking. Depending on ones stimulus preferences these emotional playlists will be automatically selected according the heart rate from an MP3 player and reproduced via a speaker integrated into the collar of the Bio Circuit vest. The collar design ensures a certain degree of privacy, shielding part of the surroundings but does not block out the space around.